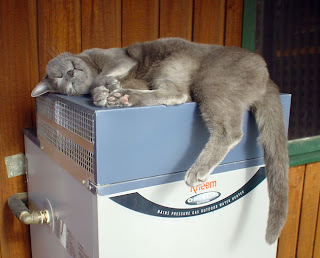 Here I am flat out on my hot water service in February. The weather has turned cooler and this is such a cosy spot. It is supposed to be hot here. Today I went outside three times in the morning and once in the late afternoon. I haven't been out much for a while, as Wallis and Jai are always lurking around and trying to swat me or hiss at me (or both). This morning, as neither of them were in our yard I took Lynettea out, so she could watch me sniffing around. I nearly caught a grasshopper, then tried to climb up the grapevine, but Lynettea grabbed me while I was on the trunk. She is a spoilsport. Then I sat around for a while in the sunshine and later went inside again. This is one of my pawsies that was sticking out. 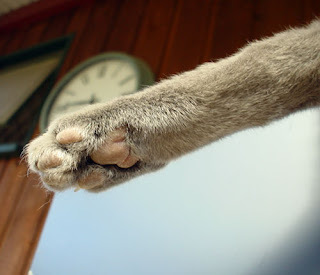 I don't know why Lynettea took this photo, although I have to admit it is a very attractive pawsie. No other news to report. I think I should go to sleep again now. I didn't nominate any other cats to receive it. Well I went to the blog of two new visitors to my blog and had a lovely surprise watching several beautiful videos of the two kittens in action. They definitely made my day! Wrigley and Cobalt please accept the award and send it to other kitties whose blogs make your day. Today I went outside on my lead with Lynettea. We stood under the grape-vines in the shade while Lynettea looked at the grapes to see if they were ripe and if any were left, after the birds had helped themselves to the top of the bunches. Wallis was sitting under the lemon tree. I made a few quiet remarks to him as we went out, but he didn't reply. Then he came past me and went right up to my face and hissed loudly. I was quite taken aback, but because I am very well mannered and never hiss I didn't do anything. After that display of rudeness I didn't feel like staying out anymore and we went in. Lynettea tried to take me out this evening, but I didn't want to go. It would be nice to have a little pleasant kitty friend. I so enjoyed watching Wrigley and Cobalt playing with one another. There was a little kitten over the road that used to come and play around me. Mostly jump on me, but I was very tolerant. That kitten disappeared and we hoped that some nice person had given it a home. Perhaps my only cat friends will be those on the Internet. Fortunately I get a lot of cuddling from my bean.